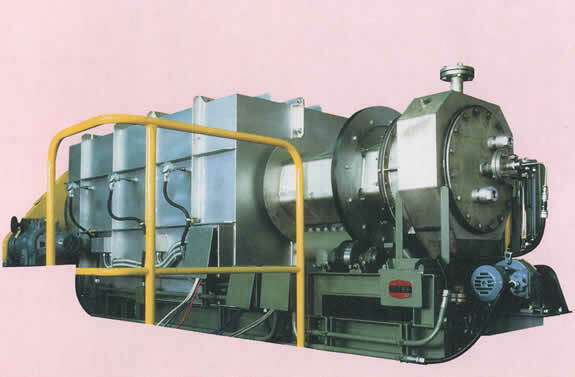 Continuous, External Heating Type Rotary Kiln | Product Information | KURIMOTO, LTD. 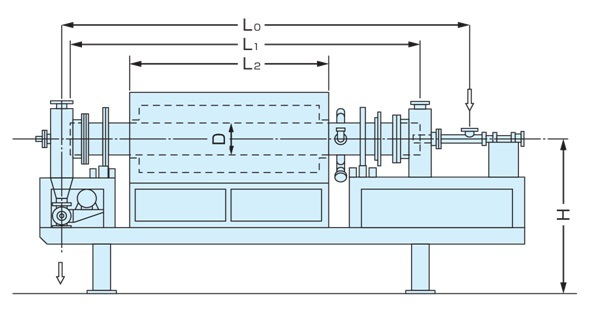 Compared to cylindrical shell, this shall provides less "shear" of the material layer, a sharp distribution of residence time, and less uneven calcining, increasing the material holding ratio to make the equipment compact in size. Introduction of superb air sealing performance and special sealing construction enables sealing up to a maximum of pressure of kiln internal pressure±500Pa. Besides oxidized (i.e., in the air) or neutral (i.e., nitrogen gas or carbon dioxide gas) gas, reducing gas can be used. Carrier gas or reaction gas can be charged thanks to the improved sealing performance. The calcining temperature is directly measured with sheathed thermocouples inserted in the material layer. Introducing the multi-chamber type of electric furnace enables independent temperature control of each chamber. The material temperature is selectable up to a maximum of 1000ºC. Furthermore, if you use gas or heavy oil as the heat source, please introduce the hot air circulation system for energy savings. The shell speed varies with the use of the variable speed motor (10:1). Furthermore, variable inclination system is also available for the shell. The retort, heating oven, and feeder are set up on the common platform, facilitating the installation work. Small-sized kilns come with casters (wheels) for relocation use. Superb air-tightness enables application to the high temperature reaction process of various kinds of powders in an acid, neutral, or reducing atmosphere. Various kinds of stainless steel, Inconel, hastelloy, or heat resisting cast iron (Kurimoto Thermalloy) is used for the shell with consideration given to resistance to heat and corrosion. The rotary kiln is available for the processing of fine chemical materials up to micron order in size including pigments, ferrite, active carbon, carbon black, various kinds of ceramic materials, powder and particles such as industrial chemicals, and pellets. We can support your calcining operation with batch type of rotary kilns.